Repairing the garden for spring includes such tasks as reseeding the lawn, checking perennials and shrubs for winter damage, and adding new mulch to areas where snow and ice melt may have moved it off the garden beds. Take an hour or two and spruce up your garden this spring before you get too busy with all the spring and summer tasks at hand. Your garden will thank you for it! Repairing the garden for spring means tackling all those miscellaneous tasks that add up over the wintertime. Winter takes its toll on the garden. Snow and ice snap branches or heave perennials out of the soil. Snow and ice melt, creating run off water that can dig channels on slopes or even push mulch out of the way. Use this handy checklist of tasks and get your garden ready for spring. Spring is the best time for lawn repair and maintenance. Take a look at your lawn. Are there bare patches? Discolored patches? Both indicate places where you should reseed. To reseed, simply rake the area and sprinkle seed on the patch. Water, and keep the area moist until the seeds sprout. Rake: This removes dead grass and any leaves you missed in the fall. While raking, examine the lawn for signs of pests and problems. Fertilize: Fertilize the lawn with an appropriate lawn mixture, following package directions. You can also spread a thin layer of peat moss or compost over the top of the lawn. This adds nutrients without smothering the grass itself. 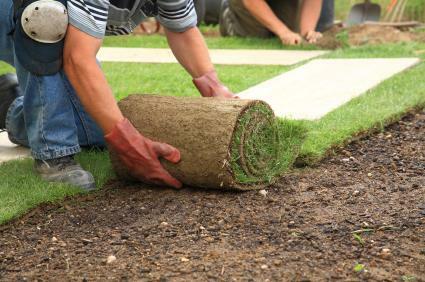 Plant Sod: Spring is a great time for laying sod. Be sure to clear the area where you want to plant sod, add amendments to the soil, and rake it smooth before laying down the strips of grass. Once the sod is in place, water it daily to help it establish strong roots. Check your perennial flowers for signs of winter damage. Look around the roots of the plant. If the plants were inadequately mulched in the fall, the constant thawing and freezing of the soil may cause heaving. Heaving means the plant has pushed up slightly out of the soil. If this happens, you may need to press the plant back down and add more mulch or soil around the root area. Add another layer of mulch for protection. Broken branches on shrubby perennials should be trimmed. Any perennials that appear to have snapped or encountered winter damage should be trimmed gently before new growth appears. Now is the time to add compost and other soil amendments. It's best to work the soil when it's not too wet; very wet soil can be compacted and actually damaged if you start digging into it. In early spring, soil can sometimes be soggy thanks to melting snow and frozen ground. Wait until the soil is workable without being muddy. Add compost, turning it under in areas that haven't been planted yet. You can also top dress or add compost just to the soil surface around existing plants. It will break down over time and filter nutrients through the soil. After spring's warmer days melt away any existing snow or rain, you can see damage left by rainwater run off, especially on hilly or sloped areas in the garden. Look for channels or furrows dug by rainwater run off. You may need to call in a professional for severely damaged areas. Moderate to mild damage can be filled in with soil or compost. Consider adding plants to any sloping areas, both to prevent water damage as well as retain soil. The plant's roots will help hold soil in place on slopes and hillsides. Be sure to restart your sprinkler system, reconnecting hoses and sprinklers according to the system directions, or call your lawn care company back to restart your underground sprinkler systems. Check your gardening tools. Perform lawn mower maintenance now before you get too busy mowing the lawn in late spring and summer to worry about oil changes and other tasks. Sharpen blades on pruners, or invest in a new pair of pruners. Check your garden gloves too and replace gloves so worn there are holes in them. Gloves protect your hands not just from dirt thorns but from the occasional encounter with a garden critter such as spiders. You don't want a scared spider finding a hole in your glove! Lastly, check your seed starting supplies. With spring just around the corner, you'll want plenty of your favorite seeds on hand to start your garden.